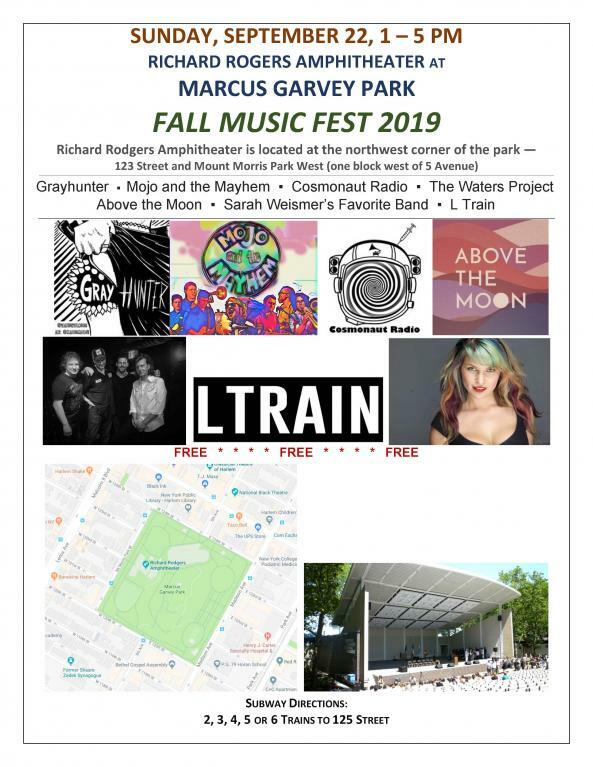 Fall Music Fest 2019 will be a free music show on Sunday, September 22 from 1 till 5 pm at Richard Rodgers Amphiteater at the northwest corner of Marcus Garvey Park, which is easily accessible ty the 2, 3, 4, 5 or 6 trains. There will be several great local bands performing, including Grayhunter, Mojo and the Mayhem, Cosmonaut Radio, The Waters Project, Above the Moon, Sarah Weismer’s Favorite Band and others. It’s a free show at an amazing facility, come on down!